Stream of consciousness: I was thinking last week how nice it would be to go to the ocean. My wife Sue and I love the coast, but we haven’t made it over there yet this year. That got me to thinking about sand, along with sand sculptures. 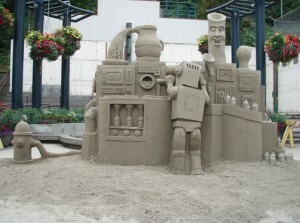 Then I realized that this weekend (Friday-Sunday) is the annual “Arts in Action” festival in Port Angeles, where I’ve always been amused by the most humorous and interesting sand sculptures. So I scanned the Internet for photos and videos of sand sculptures. I was able to find larger sand sculptures in Portugal and more intricate ones in various other places, but I believe the most amusing ones may have been created in PA, which claims to be the only “masters invitational” for sand sculpture in North America. This year’s theme is “Wonders of the World,” which would allow ideas ranging from The Eiffel Tower to a two-headed goat, according to a press release from Nor’Wester Rotary, which sponsors the event. For killer whale fanatics, this year’s festival will include sidewalk artist Ian Morris, who plans to draw one of those three-dimensional illustrations that make you believe something is coming out of the sidewalk when viewed at the correct angle. Morris will draw a leaping orca, according to press information. Regarding sand sculpture, a Flicker user named DogAteMyHomework put together a nice slideshow of last year’s Arts in Action festival.